The attacks came so often that they disrupted the family’s daily life. Jalen found it challenging to make friends at school because he was often home sick and Vanessa struggled to manage ER visits while raising her three children and juggling her career. “I almost lost my job because I was out so many days with Jalen,” she said. Jalen’s asthma attacks continued into 2012—the year the hospital became a partner in the Medical Home Network (MHN), a Medicaid pilot connecting primary care providers and hospitals to improve the health of Medicaid recipients in underserved Chicagoland areas. Through the use of MHN’s web portal known as MHNConnect, health care providers on Chicago’s South and Southwest Sides can securely and confidentially share patient information, including real-time data on a patient’s ER and inpatient activity even before the patient sees a doctor. 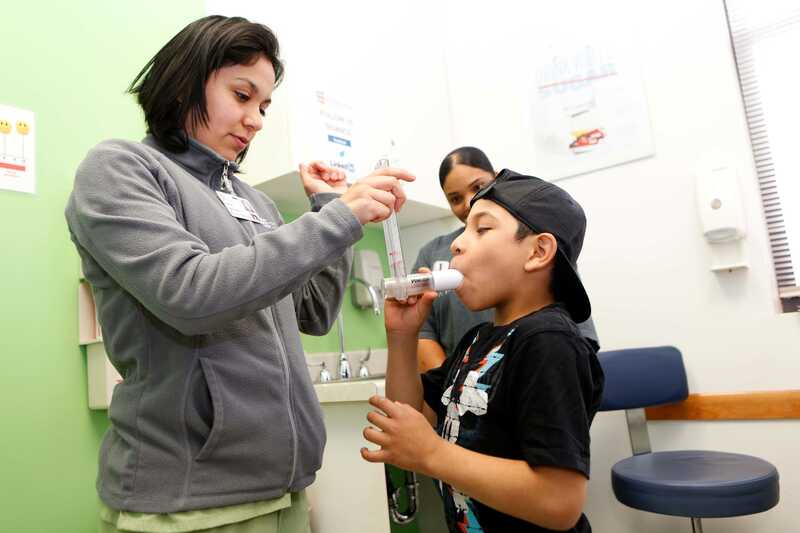 Isabel Camacho, a medical assistant at Esperanza Health Center, works with asthma patient Jalen Sanchez at Esperanza Health Centers. Previously, most health care providers, such as competing hospitals in the same neighborhood, did not collaborate. Without access to a complete medical background, such as previous ER visits, historical claims, and prescription information, there were often gaps in patient information. Through the MHNConnect portal, medical facilities ensured patients’ visits to the ER, hospital inpatient settings, and primary care facilities (known as “medical homes”) were documented, logged and—perhaps most importantly—actively managed. This is how Carmen Vergara, Clinical Quality Improvement Coordinator at the Esperanza Health Centers, Jalen’s assigned primary care medical home, learned about Jalen. “Jalen showed up on our portal quickly after [it went] live,” she said. Through the information on the MHNConnect portal, Carmen knew that he made regular visits to the ER and that his mother often did not pick up his prescriptions. With Esperanza just a few blocks from the ER, she saw an opportunity to improve Jalen’s care. During Jalen’s next ER visit in February, Carmen received an alert through MHNConnect and headed over to the hospital. When she found Jalen and Vanessa waiting for the doctor, she introduced herself and the new program. Vanessa and Jalen Sanchez with Carmen Vergara, Clinical Quality Improvement Coordinator at the Esperanza Health Centers. I told Vanessa that, by bringing Jalen to Esperanza, a pediatrician could get to know him and we could better understand his [condition] and try different medications." As a patient at Esperanza, Jalen would have shorter wait times and a pediatrician who could provide the preventative care and education required for him to manage his condition. The change also benefits the state. For example, on Chicago’s South side, 40 percent of the 750,000 residents are uninsured or reliant on public insurance programs such as Medicaid. Because visits to primary care doctors cost significantly less than visits to the emergency room, the shift will keep costs down. Over the next several months, Carmen nurtured her relationship with Vanessa and Jalen by checking in after their trips to the ER, visiting their home and sharing more information about Esperanza. According to Vanessa, the turning point came when she shared her primary obstacle to visiting Esperanza: She struggled to get appointments on the same day Jalen felt sick. Carmen gave Vanessa her direct number and assured her that Jalen would have an appointment whenever he needed one. 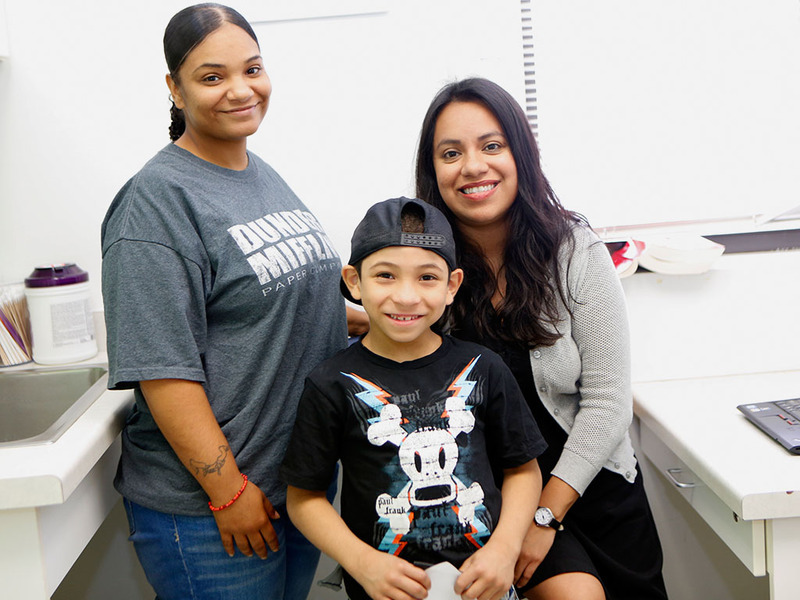 Vanessa and Jalen began to make regular appointments at Esperanza, where they worked with a pediatrician and allergy specialist. In addition, Carmen continued her follow up with phone calls to check on progress and to remind Vanessa about medications at the pharmacy. The visits and monitoring paid off. In the past seven months, Jalen has not suffered a single asthma attack. Carmen knows that, without MHNConnect, the attention Vanessa appreciates would not have been possible. Success stories such as Jalen’s are a result of what Cheryl Lulias, MHN’s President and Executive Director, calls the “holy grail” of patient care: a combination of health information exchange and patient engagement. If MHN’s model of care continues to be effective in Chicago, it could soon become a model for improving patient care and lowering medical costs across the country. This program is a gift. It’s a proof of concept vehicle and a chance to innovate on a daily basis.